How to make your portfolio perform better? The performance of the portfolio becomes the basis for you to achieve your financial goals. Every investor must consistently try to make his/her portfolio perform better. A financial portfolio is a collection of your investments. The performance of the portfolio becomes the basis on which you achieve your financial goals. Every investor must consistently try to make his/her portfolio perform better. 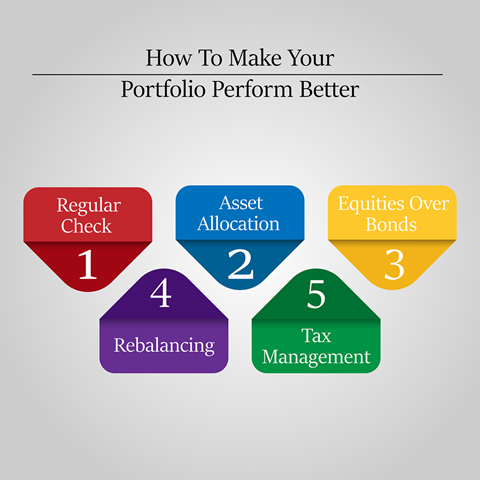 Given below are some tips that can allow your portfolio to perform better. Your portfolio's performance highly depends on your decision to sell or buy stocks at the right moment so that you don’t incur losses on your investments. To know what time is best for you to sell or buy, you have to check the investments in your portfolio regularly. A big reason that many portfolios fail to perform well is the lack of attention they get. If the investments are regularly monitored, you will be able to determine which investment is doing well and which isn’t. To ensure that your portfolio performs better, you should sell those shares that you think can negatively affect it. You can also sell the shares which are doing too good and book a profit. Either way, continually checking your investments can prove to be a useful tool to help your portfolio to perform better. Asset allocation is the percentage of money an investor puts in different asset classes such as shares, fixed deposits, derivatives, or bonds. For the portfolio to perform better, assets should be allocated efficiently. An investor should allocate his/her assets only after identifying their long-term financial goals, their risk appetite and the period they are willing to wait to see the returns. Determining the percentage of the money you would want to invest in different asset classes to achieve your long-term financial goals is one the most important factors in making your portfolio perform better. If the asset allocation is done perfectly, there is no chance of your portfolio making huge losses. It is true that the equity market is a risky and volatile platform to invest in, but it is equally capable of earning you huge profits. The equity market has outperformed the bond market consistently over the years, and a manageable mix of equities and bonds will go a long way in making your portfolio perform better. Bonds and other safe investments like fixed deposit can be used as tools to earn a regular fixed income. But having equities in your portfolio can result in huge amount of profits in half the time as compared to bonds and fixed deposits. It will also positively affect the overall performance of your portfolio as you will able to achieve your financial goals effectively. It is important that you rebalance your portfolio from time to time. Rebalancing is the most efficient and automatic way by which you can avoid the risk of emotions and can buy low and sell high, resulting in your portfolio to increase its performance. Taxes can lower your profits significantly as they are the biggest subtraction from the profits you make in the market. You should keep the investments which are tax-efficient in your taxable account and the investments which are the least tax efficient in tax-deferred accounts. You can also consult a financial advisor or a stockbroker to manage your taxes better. As long as your tax management is up to the mark, your portfolio will keep on performing better.